Winning starts in the head! The other evening I really enjoyed watching a BBC Postcard interview with the American sprinter Tommie Smith. In 1968 he won the Gold medal in the 200m sprint in Mexico City Olympics. During the award ceremony, he raised his gloved right fist in protest again racial discrimination. He also ran in black socks, which, with the black glove, represented the need to survive. Going without shoes represented poverty. 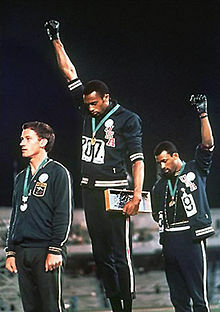 Smith was motivated to win so he could make a statement about racial injustice. He had something important to say. On his return to California he was treated as a traitor and for many years he couldn’t find a job. He has to be admired for standing up for his convictions and his fight against racial injustice. Thankfully, legalized racial discrimination is now a thing of the past. For many years Smith worked as a sprinting coach and his key words for succeeding are these: “if you want to succeed you have to watch what goes on in your head”. This doesn’t only apply to sprinting, but whatever we wish to succeed in. Our thoughts direct our behavior, not the other way round. If you want to do well, you have to visualize and believe success. You have to watch your self-talk, which is all that non-stop chatter that goes on in your head. “You’re what you believe” said Smith. Obviously you also have to do the physical training, but success starts with the head, what you believe about yourself. Winning also starts in the head. “If you run as fast as you can, you win. You might not hit the tape first, but you have won in your own mind because you beat yourself from the last time.” In other words, as the Nike advert says “Just Do It”. You’re only a failure when you stop trying. Back to the London Olympics! Have you noticed how many Olympic swimmers, including Michael Phelps, stroll into the swimming arena listening to ‘something’ on their headphones. I couldn’t help but wonder what on earth they were listening to. Watching TV a BBC interviewer must have read my mind because he asked a sports psychologist the very same question. “What goes on in your mind is very important if you want to perform to your max”, he replied. There we go again with this ‘mind thing’! “It all starts with the mind” said Smith, years before. All the shouting and excitement from the audience can be distracting as the athletes prepare themselves for the race. So rather put on the headphones, turn up the volume and fill your head with music that’s motivating, that will psyche you up for winning. 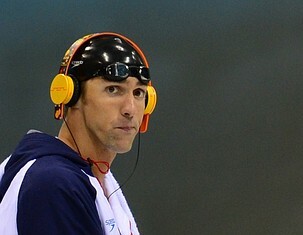 I wonder what Phelps listens to. I’m sure it’s not country music nor do I think it’s Dori singing “Just Keep Swimming,” in the movie Finding Nemo! Application to all of us non-Olympic medalists! It all starts in the mind. Be careful of the thoughts you entertain. 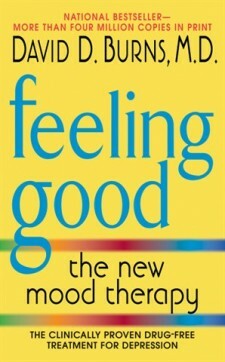 If you’re battling with depression, your thoughts can be extremely debilitating. Just remember that the mind can only hold one thought at any one given moment in time. So … if you have thoughts that are pulling you down or negative thoughts dominating your mind, do as these athletes do. Find music that inspires you and lifts your spirit, load them onto you MP3 player, put on the headphones and tune yourself into some more upbeat words of encouragement. Start singing and dancing to the music!